I’m an early morning riser, so that’s the best time for me to write, a cup of coffee by my side and zero interruptions. Yes, I quickly check email and social media, but then it’s down to business for a few hours. 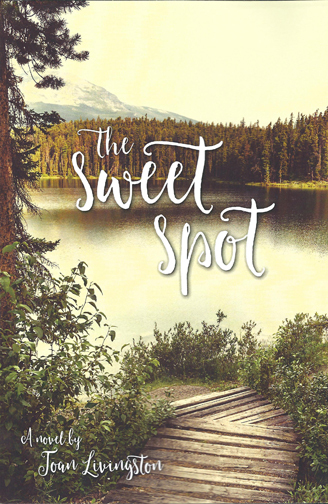 My latest novel, The Sweet Spot. I know people who write in coffee shops and libraries. Some go on retreats. My place is a room of my own in our home. I am fortunate to have a desk built by my husband, Hank, from black walnut boards somebody was going toss. He also built me desktop shelving units to store papers, cords and other tools. Then, there’s the view out my large window of the Taos mesa — if I squint I can pretend the sagebrush is the ocean — and the Sangre de Cristo Mountains, its peaks still snow-covered in April. I keep my office area neat and uncluttered. I’d like to think my mind is the same way, ha. When I first began writing fiction, I was an editor at a daily newspaper. I left for that job promptly at 6:10 a.m. So, I wrote at night after dinner, printed whatever I wrote, and marked up the copy at lunch. Ten years ago, after I moved to Taos and worked at a paper here, I got up very early to write before heading to the newsroom. Of course, there were the weekends. After leaving my post as a newspaper’s managing editor nearly a year ago, I maintain my early morning writing spree but also gleefully find time during the day when the spirit moves me. (I now have teaching, editing, and book review gigs.) I sit at my laptop whenever and let it fly. 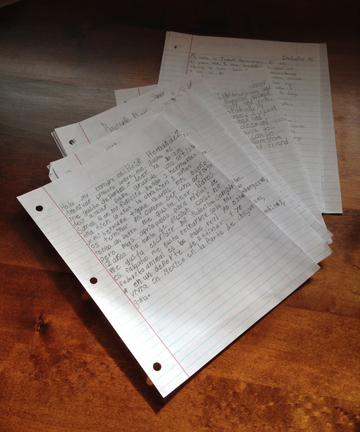 As I’ve gained confidence in my writing, I do less printing as I go along. I usually wait until my novel has some real heft before I print anything, maybe halfway through. And, yes, I back it up, back it up, and back it up. I don’t belong to writing groups. It’s not my thing. I don’t even show people what I write until I feel the novel is ready. However, I made an exception for a mystery I’ve just finished. I let my author friend Teresa read the chapters as I finished them. She gave a great deal of encouragement along the way. I finished that novel in less than five months. Hmm, I might be onto something new. 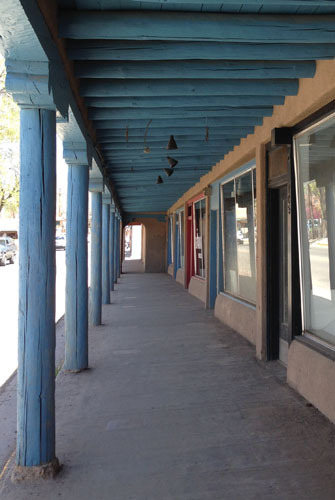 ABOUT THE PHOTO ABOVE: This walkway along Paseo del Pueblo Norte in Taos caught my eye the other day. The comma became a recent internet sensation when a court in Maine kept a lawsuit alive in which dairy drivers are seeking $10 million in overtime pay. I’m rather proud to say the comma was a key piece of evidence for my suit in small claims court although at a much, much smaller amount. What’s a serial comma? It’s the one used after the second to the last item in a list of three or more. I was amused because I used the humble but meaningful comma to my advantage. I claimed the insurance company that sold us an extended warranty should cover the cost of repairs after the engine block on our Subaru cracked. Naturally, the company said no. It wasn’t going to dish out the nearly thousand bucks we paid to get the car back on the road. That was years ago, but I recall blowing up a photocopy of the contract — with the significant comma — as evidence the repair should indeed be covered. Yes, it came down to a serial comma. The judge at the small claims court agreed with me. I guess the company saw the error of its ways because it sent someone with a check to the hearing. During my 30-plus years as a journalist, I will admit to having a very casual relationship with commas. They don’t appear in news stories as often as they do in other types of writing. That includes serial commas, which are not used except when absolutely necessary. My theory is that long ago the guys in the pressroom decided to save on ink by eliminating most commas. I refer to them when I find myself slipping into my old ways. ABOUT THE PHOTO ABOVE: That was a delicious cake Betty at Op. Cit. Books in Taos had at my reading March 25. 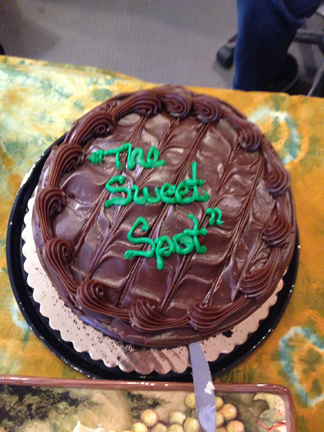 Yes, she had the bakery put the title of my new novel, The Sweet Spot on the top. How fitting! And for those wanting a copy of The Sweet Spot here it is on Amazon. I like characters who are crusty old coots. My next novel, The Sweet Spot, has good one. His name is Alban Sweet. The Sweet Spot is the first of my hilltown books to be launched, this one in January. 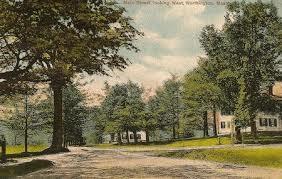 As I’ve explained before, they are set in a rural stretch of Western Massachusetts, where my family and I once lived. I also reported on it for a local daily. The town of Conwell and the characters in my book are fabricated although, heaven knows, those little towns (population 1,200 and fewer) are full of characters. Alban Sweet, who is known as Benny to most everyone except his late wife, his sister, and a few of the old-timers, would feel at home. He’s Pop to Edie, his daughter and the novel’s main character. His granddaughter calls him Poppy. Alban is a rascal of a guy who has run the town dump for about 35 years. (The novel is set in 1978.) He brings home the stuff people toss out that he feels still has some value. The outbuildings behind the home he shares with Edie is full of the junk. Yeah, he’s a bit of a drinker. And he has a notorious feud with the town’s road boss because he keeps borrowing stuff from the highway department without asking. In keeping with a good feud, the road boss makes sure his dirt road is plowed and graded last. Alban loves his daughter and granddaughter, Amber. (His other two daughters won’t have anything to do with him.) He would do anything for them. His love is true. By the way, Alban is made up and not based on anyone real although I will admit I have met more than my share of crusty old coots. And, yes, my other hilltown novels have them. Here’s a scene from early in the novel. Edie and Amber have just returned from a Memorial Day party at her in-laws. Earlier that day, the town has a ceremony to honor the soldiers who died in war, including Edie’s husband who was killed in Vietnam. Alban wasn’t invited to the in-laws’ because he got stinking drunk one year and insulted one of the guests. So, Edie and her daughter brought Pop a plate of chicken and the fixings from the party. By the way, the character, Harlan Doyle, has a significant role as the book moves along. Edie watched her father eat. His thick white hair fell in front of his eyes. She needed to cut it again. “What’d you do today?” she asked. Pop ran a hand over his whiskers. He grunted. “I straightened up the place,” he said. Edie laughed because the room was filled tightly with junk. The kitchen sink was stacked high with dirty dishes. She and Amber would have to wash them tomorrow. Pop cut two short rows in the grass before he left the mower next to the old doghouse filled with gas cans. Edie wasn’t surprised. The closest distance between two points for her father was usually a crooked line. Edie planted a hand on her hip. “I saw how far you got. It couldn’t have taken very long,” she said. Pop made smacking noises with his mouth. He pointed toward the hutch. Amber went to the hutch. She held a wooden box when she twirled around. Pop’s eyes grew bigger as he told Amber to twist the crank on the box’s bottom, and after she did, the workings produced a tiny, tinny tune. Edie shifted in her chair to give her daughter room. Amber opened and shut the lid. She smiled at the gift and at Pop. Edie hoped her daughter would never be ashamed of her grandfather. Even though Ma got mad at Pop, she always defended him for working hard for his family. “Somebody has to take care of the dump,” her mother said when her sisters complained how horrible their father smelled. 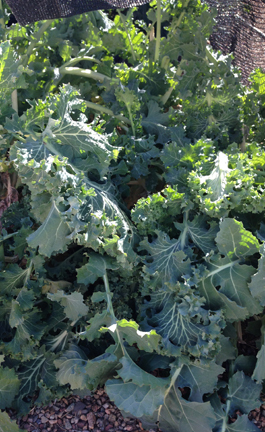 ABOUT THE PHOTO ABOVE: Yes, it is late November and I still have kale — and chard — growing in my garden despite very cold nights. Being a good Portagee, I have to grow kale. I make kale soup once a week, enough to last three days. FINAL NOTE: Here is the link to my first novel Peace, Love, and You Know What on Amazon. If you live in Taos, you can find it at the local book stores.